I often tell people that 2007 marked the beginning of the mobile “industrial revolution”. That year marked the advent of the iPhone, then the App Store in 2008, and the tablet in early 2011. The adoption of mobile devices an apps since then has been staggering and has provided a foundation for massive and disruptive change in the way we live, work, play and learn. As of June 2013, there were over 1 billion active Android devices and 700 million iOS devices, Combined apps available on smartphones now exceed 500,000 and total tablet shipments have exceed 200 million units in less than just 3 years. This proliferation of mobile devices has fueled new markets and value creation opportunities that heretofore would not have been possible. Would a world of being able to save, borrow, or pay money using only a mobile device existed 5 years ago? The momentum behind “mobile first” both for consumers and businesses is staggering. Mobile has always been a core part of Storm’s investment footprint, and in particular we would like to think that we are also investing in themes that will help power what we call the “mobile economy”. 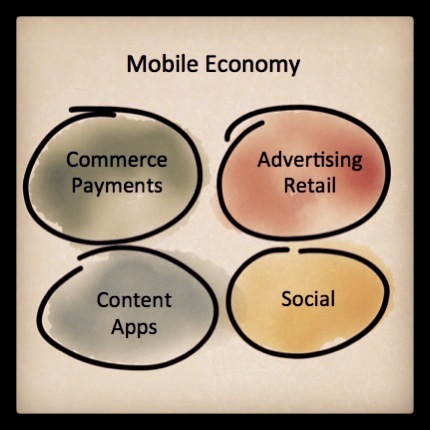 The chart below is perhaps an oversimplification but in my opinion are the 4 major pillars that form the mobile economy. Examples of companies that help support this thesis are Cellfire (digital coupons: Advertising/Retail) , Flint and MiMoni (mobile payments and micro-loans: Commerce/Payments), Modo Labs, Averail, and Mobile Iron (apps, mobile file management and MDM: Content/Apps). Cellfire for example, has built the largest digital offer network in the US and is able to deliver over 50 million digital offers per month to grocery loyalty cards. The company has 80 -100 offers available at at any one time from over 110 CPGs, with the large majority of the content volume from two of the world largest CPG companies. Cellfire has also integrated with over 88 grocery brands representing over 17,000 retail locations. The most prominent are Safeway $43B sales) and Kroger ($97B sales). The total sum of active users are loading 12-15 offers per month, at an average overall rate of 20 coupons/second in aggregate. That’s a clear example of how mobile is enabling “saving” that is scaling exponentially. Flint Mobile, on the other hand, has emerged as a unique payment solution for the 17 million mobile micro-merchants using only a mobile device (iOS or Android) with no additional hardware to accept payments from debit or credit cards. In addition the solution is integrated with social and CRM marketing tools that allows these merchants to enter the digital world with only a mobile device. The company formally launched in 2013 and is seeing rapid adoption (over 150,000 iOS downloads) and growth by a wide range of mobile merchants (6x transaction volume growth over 3 quarters). Finally, Mimoni is focused on lending (borrowing). They are leveraging the credit risk software platform and service processes they developed for the unbanked in Mexico (~80 million people), which was initially used to provide to convert 60,000+ pre-paid cell phone plans to post paid, to now address the very large and lucrative micro loan market in Mexico (in an automated self-serve manner). Mimoni is Mexico’s first online short-term credit provider for the creditworthy unbanked. In its first 60 days Mimoni acquired over 30,000 and loans processed are currently growing at 20%+ per month. Mimoni’s convenience, privacy and ability to provide very small loan amounts for a short time disrupts the two existing formal players: micro lenders, $6B annual market, growing at 150% and Pawn Shops, $5B market growing at 400% per year. We are at the tip of the iceberg with respect to the opportunity mobile represents with respect to transforming how business operate as well as how we manage our personal lives and time. It is exciting to participate in this rapidly changing, disruptive and new mobile economy.